To run microservices on docker environment we need to create docker images for microservices.This document provides steps to create docker images for microservices. 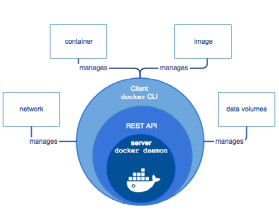 Docker is an open platform for developing, shipping, and running applications. Docker enables you to separate your applications from your infrastructure so you can deliver software quickly. With Docker, you can manage your infrastructure in the same ways you manage your applications. A server which is a type of long-running program called a daemon process (the dockerd command). A REST API which specifies interfaces that programs can use to talk to the daemon and instruct it what to do. A command line interface (CLI) client (the docker command). A swarm will consist of managers, nodes and services. A node is basically a worker of your swarm, it will only receive instructions. A manager is a node that can give instructions to your swarm (i.e. creating and removing services). Managers can also run instances of services. A service can have multiple replicas and Docker will distribute them evenly across your nodes – if you have 3 (active) nodes and a service with 3 replicas, each node will have a running instance of that service. For any service in the swarm, Docker will do a round-robin between the replicas (shameless plug, watch Load balancing is impossible). Docker call this feature of distributing incoming connections from outside the swarm ingress load balancing. Is important to say that if you access a service from within the swarm it will also go through the built-in load balancer. If you try to access a service on a node that’s not running it Docker will re-reoute the request to a node that has a running instance of that service. Here the component labeled LB is serving as a reverse proxy and it will have to be able to discover new nodes in your swarm dynamically. Mail your problem details at writeulearn@gmail.com along with your mobile numberand we will give you a call for further details. We usually attend your problems within 60 minutes and solve it in maximum 2 days.